RIO DE JANEIRO, BRAZIL – When the Portuguese first encountered the deep inlet of the Guanabara Bay on January 1, 1502, they thought it was the mouth of a river – hence the name Rio de Janeiro (January River). Since then the city grew up around the tropical shores and has spread inland, but exploring Rio by sea remains a great way to experience the area. 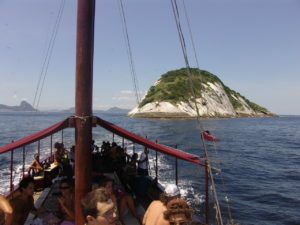 Rio’s stunning scenery around the bay can bee experienced by sea, photo by Rosane Abreu Moço. The Marina da Glória serves as home to many docked boats and ships and is the starting point for most of the boat tours in Rio for tourists and locals alike. Once there private boats can be chartered from the dock itself by approaching the owners of the boats. Also there is the Saveiros Tour outfit that offers daily outings, but require reservations be made the day before passengers plan to join their tours. 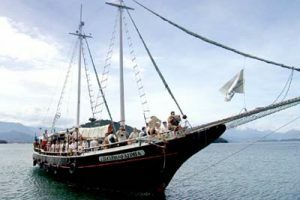 Established in 1978, Saveiros Tours, offers excursions on the waters of Guanabara Bay via their schooner. Fresh tropical fruit is served during their tours and there is also an English tour guide for the Tuesday through Sunday trips. Beginning at 9:30 AM their tours include nine major points of interest. The first is the Marina da Glória itself from which there are spectacular views of the Guanabara Bay. Second, there is the Aterro do Flamengo, an urban park designed by Lota de Macedo Soare, and landscape designer, Roberto Burle Marx in the 1960s. The next sight on the tour is that of the neighborhood of Urca, home to the famous tourist attraction of Pão de Açúcar (Sugarloaf Mountain). From the water, passengers can watch as the cable cars slowly ascend to and descend from the peak of the famous landmark. The Saveiros Tours vessel rounds the bay daily, photo by Saveiros Tours. Next the schooner passes two of the four remaining forts that surround Guanabara Bay; Forte da Lage and Fortaleza da Barra de Santa Cruz. From there, the tour continues across the bay, passing by Niterói ’s Contemporary Art Museum (Museu de Arte Contemporânea de Niterói – MAC). Designed by Brazilian architect Oscar Niemeyer, the museum is a marvel of modern architecture and is often likened to a flying saucer. The tour will then make its way past the Ponte Rio-Niterói, a 13.29 km bridge constructed across the Guanabara Bay that connects the two cities. Completed in 1974 it is the sixth longest bridge in the world. The Brazilian Navy Port Marinha do Brasil is the next site on the itinerary, followed by Ilha Fiscal, part of the Cultural Complex of the Brazilian Navy. The Monumento aos Mortos da Segunda Guerra Mundial, a momument to the fallen soldiers of WWII, is the next sight and finally passengers will see The Modern Art Museum before the boat docks, ending the roughly two hour tour. Tickets for the tour should be booked by 5:30PM on the day proceeding the desired tour date. For reservations, call + 55 (21) 2225-6064. See more information on their website here.